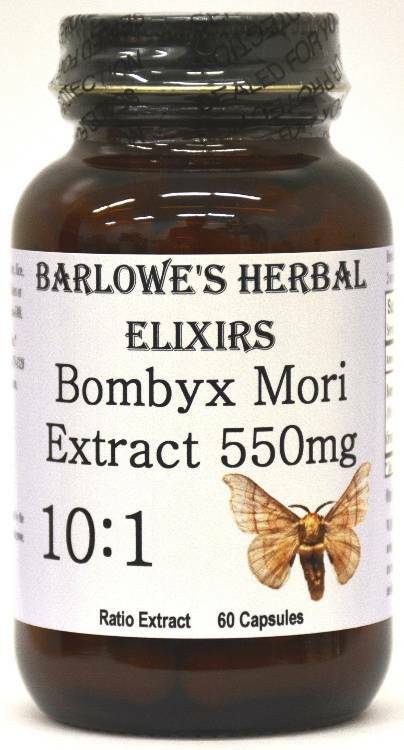 Barlowe's Herbal Elixirs now offers a high potency 10:1 Bombyx Mori (Bombyx Batryticatus) Extract. Bombyx Mori (Jiang Can) has been utilized in Asia for hundreds of years to increase virility and libido. It is a much sought after male silkworm moth extract used to energize the body and lift desire. Bottled in Glass! No Stearates! No Fillers! No Junk! 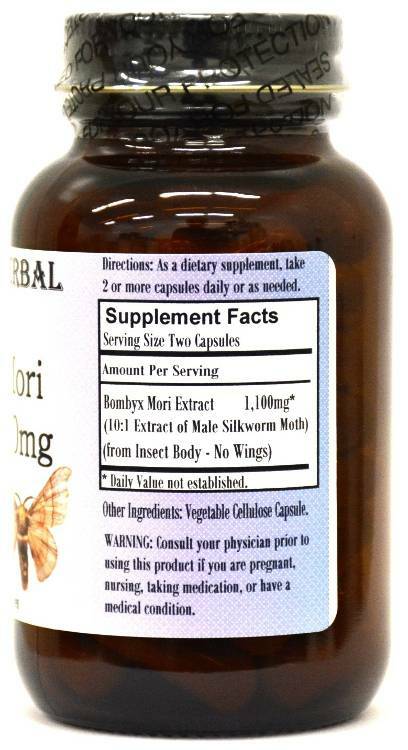 Barlowe's Herbal Elixirs now offers a high potency 10:1 Bombyx Mori (Bombyx Batryticatus) Extract. 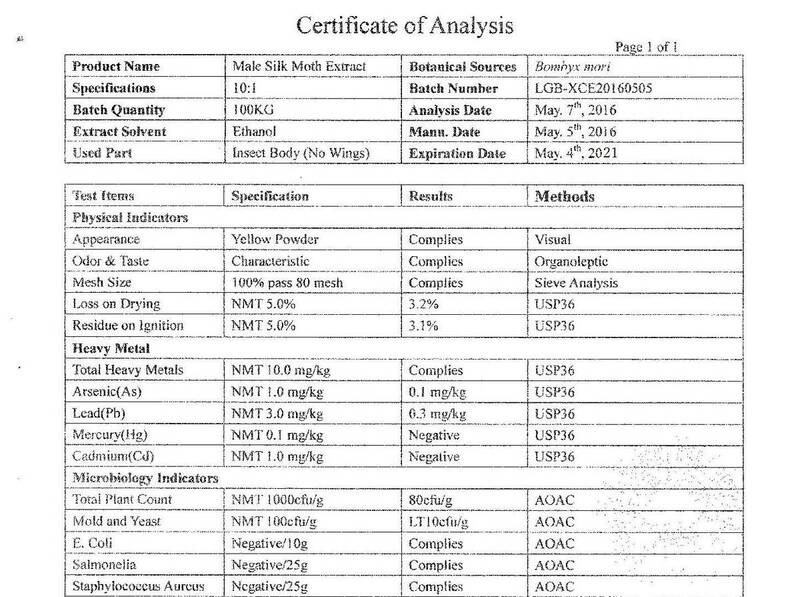 The Bombyx Mori Certificate of Analysis (COA) of this particular batch is shown above. Bombyx Mori (Jiang Can) has been utilized in Asia for hundreds of years to increase virility and libido. It is a much sought after male silkworm moth extract used to energize the body and increase desire. Full of nutrients, vital minerals and Amino Acids, it also acts as a vasodilator - increasing blood flow. Bottled in Glass! No Stearates! No Fillers! No Junk! ***These vegetable-derived capsules (Vegan, Kosher and Halal certified) are filled on slow speed equipment and only pure, unadulterated herbal extract is contained in the capsules. There are no magnesium stearates, fillers, flow agents, gelatin, silicates, gluten, corn, wheat, rice, yeast, starch, titanium dioxide, artificial colors, artificial flavors or preservatives. Capsules produced with high speed equipment in herbal and dietary supplement "factories" generally contain several other ingredients, including powdered lubricants called STEARATES (which can greatly diminish an herb or supplement's absorption into the body). Check their labels! Directions For Use: Take two or more capsules on empty stomach one to two hours prior to activity, or as needed. Results and usage amounts may vary based on body type and weight.